Following on from the inspirational moves made at Copenhagen Fashion Week, now it's Stockholm's turn to be in the spotlight. If you don't know the major difference between these two Scandi style tribes, we asked some experts to decode it so you can be forever in the know, but if you're simply looking for great autumnal wardrobe inspiration (it is September after all), then you're in luck. The weather wasn't favourable during the show period in Sweden, but this did allow the city's fashion experts to be entirely #sorrynotsorry and get all ahead of themselves by diving well into the A/W season. Puffa coats—why not? Layer upon layer of knitwear? Bring. It. On. There were less extreme steps into the new as well—a shift in colour palettes was noticeable, as was the arrival of many must-jot-them-down jackets. If you like your shopping to come with a side serving of häftigt (that's awesome in Swedish), then scroll through the gallery of our favourite Stockholm Fashion Week street style looks. Style Notes: Cue the new way to wear your favourite pleated midi skirt: with a retro branded tee and showstopping ankle boots. Just in case you haven't invested already, this is a trend that keeps on giving. Style Notes: Autumn's animal prints memo reads as follows: Go hard or go home. Even this standout piece set against a black outfit will impress the best. Style Notes: The styling trick of the moment? Pull your shirt cuffs down as far as they'll go. These cuffs are calling to you. Style Notes: This season it's entirely normal to wear furry monsters on your feet… and to keep layering slip dresses over tees. Red too crazy? Then how about a fluffy black pair? Style Notes: Skater-style trousers are on the menu, so unearth that long-forgotten teen angst and wear them with a hoodie. Style Notes: Autumn's most extreme trend is undoubtedly the rise of the jumbo shoulder—styling it with skinny jeans is a clever way to keep things in proportion. Stockpile 1980s classics like these to get the trend ticked already. Style Notes: Leopard print coats have become a catch again—we like how casually this one has been thrown on to elevate a sweatshirt and denim combo. The big investment piece for leopard print fanatics. Style Notes: Save the layering for later and wear your supersize sweaters with miniskirts and heels now. This comes in so many colours… take your pick! Style Notes: Texture, texture, texture. Embroidery, lurex, fringing and suede makes for a sumptuous mix. You read correctly, these are from M&S. Style Notes: If red is your favourite hue then this is time is YOUR time. Wear it head to toe and watch how you attract attention. When in doubt, carry a red bag. 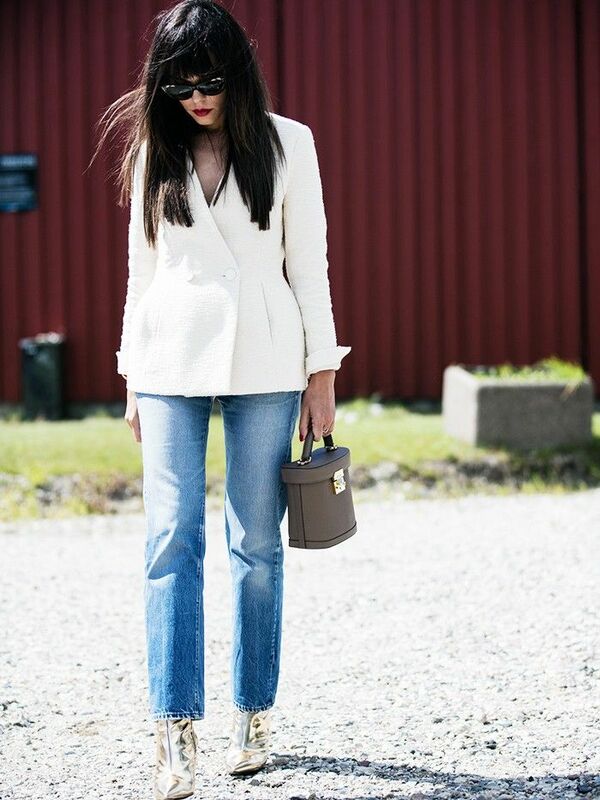 Style Notes: The kind of chic double-denim look we can get on board with—crisp indigo in tailored separates. See the best dressed celebrities of the summer, for a little A-list inspiration.